Medical Device companies operating in today’s stringently regulated environment require comprehensive software systems and solutions that deliver robust functionality and support full compliance with regulatory requirements. In the area of software design for medical devices, adherence to the applicable regulations and standards is a complex and expensive process. 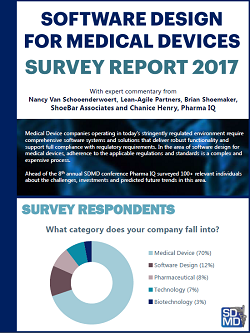 Ahead of the 8th annual SDMD conference Pharma IQ surveyed 100+ relevant individuals about the challenges, investments and predicted future trends in this area.